It was David H. Sandler who first introduced me to Transactional Analysis (TA). Needlesstosay, I was intrigued. It wasn’t until, however, my grandparents were moving out the home they lived in for 30 years, w hen I discovered the guide to TA that has me writing to you today. My grand mother was happily handing down all her library occupants, and among the non-fiction were genres such as Catholisism, self-help and various encyclopedias. 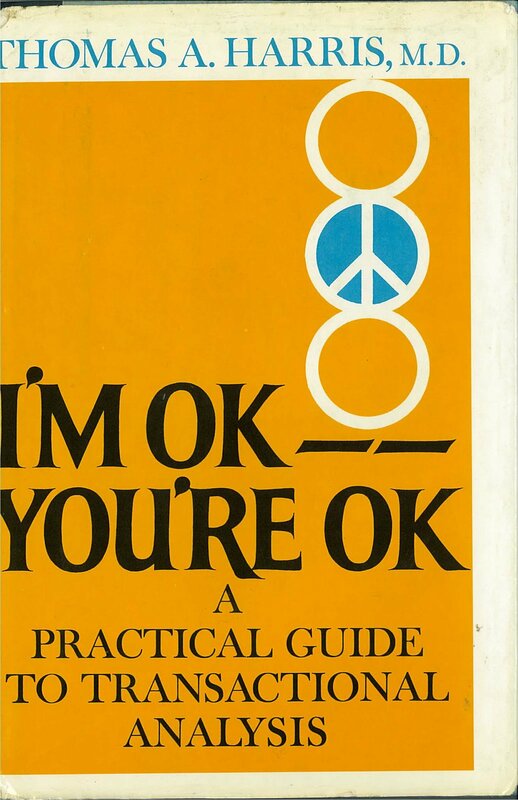 It was the bright orange cover with the black bold letters that said I’m Ok, You’re Ok: A Practical Guide to Transactional Analysis which got my attention. Copywritten in 1967, my grandmother must have gotten it as Christmas gift. The inside cover has scribbled in pencil, Barb Capezio 12/25/70. I brought the book home, along with the others, and set it aside until I had time to start reading it. I shouldn’t have waited. I should have read it the day I got it. 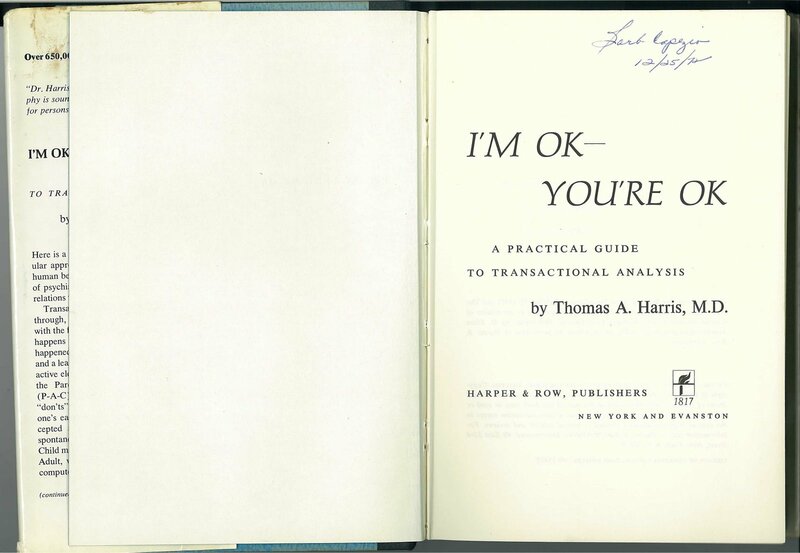 I will conclude that things happen for a reason and the various books that I’ve read since then have only been a prelude to preparing me for Thomas A. Harris’ guide to: Answering my questions to why I am the way I am and what I’m going to do about it. “Awareness means the capacity to see a coffee pot and hear the birds sing in one’s own way, and not the way one was taught,” says Eric Berne. Every being can learn to experience God or grace in his own way, and not in the way he has been taught. Every pre-programmed idea of what God is gets in the way of experiencing God. Harris states: This is why I contend that an important aspect of the religious experience of intimacy is the exclusion of the Parent. A little boy sees and hears birds delight. Then the “good father” comes along and feels he should “share” the experience and help his son “develop.” He says: “That’s a jay, and this is a sparrow” The moment the little boy is concerned with which is a jay and which is a sparrow, he can no longer see the birds or hear them sing. He has to see and hear them the way his father wants him to. Father has good reasons on his side, since few people can afford to go through life listening to the birds sing, and the sooner the little boy starts his “education” the better… A few people, however, can still see and hear in the old way. But most of the members of the human race have lost the capacity… and are not left the option of seeing and hearing directly even if they can afford to; they must get it secondhand.